I’d heard about this book before reading it, obviously, but it took me a long time to get around to reading it for myself. A former friend of mine was extremely keen on it, and associating it with that person was part of why I hadn’t read it before now. (When a friendship ends, it’s hard to disentangle those kinds of associations.) I knew it was being made into a film, too, which is probably why it was on NetGalley — I guess it’s being re-released or something, in light of that. So, I requested it. Because I figured it was one of those books I should read, as someone whose blog is about 90% LGBTQ YA books. But honestly? This book messed me up. And I don’t mean that necessarily in a bad way, but I just feel like I should put it out there: this book got inside my head, and it screwed with it. This is partly because I stayed up until twenty past three to finish it, which was ridiculous, but I was invested and didn’t want to stop (so, I guess that’s a good thing). Mostly, though, it was a psychological reaction that shows exactly why conversion therapy — the subject of the book — is so dangerous. I mean, I grew up going to church. And it wasn’t a hellfire and damnation kind of church. Actually, Cameron’s experiences of church chimed with mine in a way that very few books about Christian experiences do — the “Extreme Teen Bible” she receives sounds almost identical to the “Youth Bible” I was given at about the age of eleven, complete with little fact files and stories relating to “real life issues”. Mine’s purple rather than blue and black and the title’s different, but otherwise everything depicted here rung some serious bells. There’s even a character with cringey Christian t-shirts like, “God’s Gym, open 24/7”. And this, I think, is why it got inside my head so much. Because her church wasn’t a stereotypical one with the preacher standing up at the front yelling about how everyone was going to hell (mostly). It was, to be honest, exactly how I imagine my church’s youth group would’ve been in the late 80s, early 90s. It’s not exactly like that now (by the time I stopped going, it was definitely taking a much more chilled approach to LGBTQ issues, but even that was a recent change, and I still remember the petition against equal marriage that was passed round at after-service coffee a few years back), but it’s definitely what it could have been like. 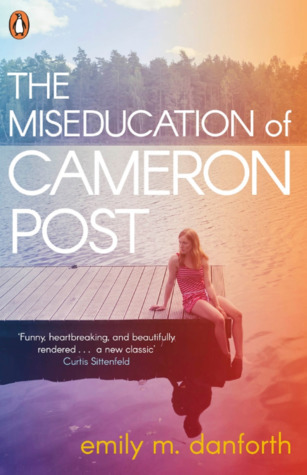 But the part of the book that really messed me up is when Cameron is sent to ‘God’s Promise’ and they start using a mixture of theological and psychological approaches to try and uncover the ’cause’ of her queerness. They analyse everything that happened to her, pick up on details of the guilt she feels about past events, look for root causes in certain familial relationships. And it got me because I think it played on a lot of my own insecurities. Especially because as an asexual person, I don’t have the affirmation of childhood attraction or whatever to say, “Well, look, I’ve always been this way.” My sexuality is in many ways defined by its absence, and that makes it very easy to think, “Am I broken? Am I like this because [X] happened and it put me off relationships forever?” I know I’ve thought things that like. I know I thought it when I ID’d as gay and then even more when I first ID’d as ace, and it took time and a lot of deliberate thought to get myself out of that state of mind. But reading those scenes put me right back into it again, wondering what would be on my “iceberg” diagram — knowing at once a few events I’d put on there, but being less sure about the rest. Even though the book portrays this as a totally wrong and harmful approach! Even though it’s in no way justifying this point of view! And it reminded me of an article I read recently where a gay journalist went undercover into conversion therapy and found that, despite having a journalistic detachment from the treatment, it planted all sorts of doubts in his head where previously there’d been none, leading to profound stress and trauma afterwards. It’s insidious. It plays on all your insecurities and, if you don’t have any, creates more. Maybe it’s because I found the book so relatable (on some levels — it also served to help confirm my aceness, because I mostly found it baffling that twelve-year-olds would be interested in kissing and whatnot) that I was susceptible to that kind of reaction, because I’d already managed to put myself in Cameron’s shoes, I’m not sure. But damn it’s going to take a few days to get rid of all those thought patterns. As for the rest of the book… it’s quite slow-based — it takes a long time to get going, and it’s never what you’d call action-packed. That’s effective, and lets you get attached to the characters, but since I tend to read faster-paced books it took a little while to get into. I really liked that there was a disabled character, Jane, who has a prosthetic leg, but that this was never exactly A Thing. I mean, it was an important character trait, not least because she keeps weed in it, but it didn’t define her, which I appreciated. Once I settled into the style, I really enjoyed that as well. The ending maybe wasn’t *exactly* what I was hoping for, because it’s quite open-ended and I’d have enjoyed some confirmation as to what exactly happened next. On the whole, though, I really enjoyed it. It just… got to me. And not entirely in a good way. *PS: the paperback edition has RAINBOW SPRAYED PAGES. You know you want it. It’s been a few weeks since I read it, so I’m doing okay now. But yikes, it got to me. Which made it all the more powerful, I guess.